Greeting you as you enter your romantic holiday cottage from your delightful patio, passing all the pretty flowers and herbs by the stable door, is a hall adorned with original paintings set against the perfect backdrop of Farrow & Ball's 'Pale Hound'. 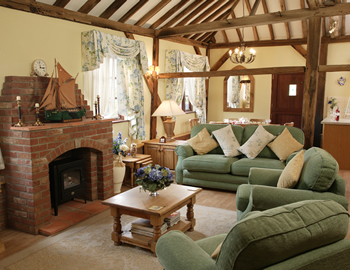 The large lounge of this luxury accommodation features a soaring half-timbered loft space, giving a true medieval feel. 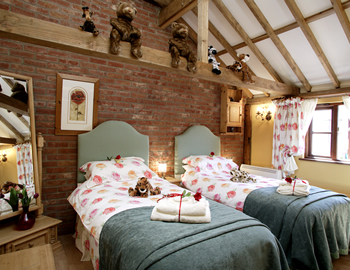 Original works of art combine with the fabulous interiors of this luxury accommodation creating the ideal setting for your romantic short break. The kitchen has all the equipment you would expect to find in a fine country home and blends in perfectly with the open plan dining area. The master bedroom, with its fully fitted wardrobes and vanity unit, creates the perfect hideaway here at Park Hall for your romantic short break with soft lighting reflecting on the beamed walls. Either side of the six-foot bed, or twin beds if preferred, two cabinets can be found complete with bedside lamps, clock radio and glass carafes. There are handmade chocolates too wrapped with ribbons and bows that perfectly compliment the colour of the flowers on the curtains and matching bed linens. Cheerful pinks, apricots and golds highlighted by the sun filtering through the south-facing window, greet you as you enter the second bedroom of this luxury accommodation. The walls of the room are a soft shade of 'Orangery' from the Farrow & Ball's paint collection that co-ordinates well with the fitted wardrobe, dressing table and bedside cabinets. A bathroom with gleaming white tiles adjoins the bedroom, with walls painted the palest shade of 'Forget me not' perfectly matching the lilacs and blues of the Liberty curtain and blind. There is a bath and shower and above the washstand and basin can be found a mirrored cabinet that lights up when fully opened to reveal toiletries within. There is even a towel rail and towels bound in ribbons that enhance the overall picture of this wonderful romantic holiday cottage. 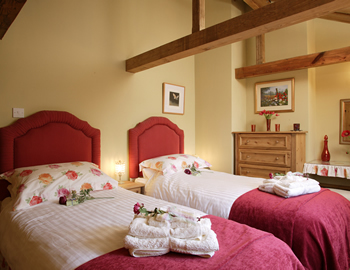 Enjoy Nights For Free, arrive on a Friday or Monday afternoon and have a leisurely three or four days in an award winning romantic holiday cottage nestled in the grounds of Park Hall. For more information click here.